Israeli Prime Minister Ehud Olmert on Sunday declared it a "disgrace" that dozens of unauthorized West Bank settlements were standing four years after Israel promised to dismantle them, following pointed criticism from President Bush. In a meeting with political allies, Olmert used the harsh word "disgrace" to show his determination to implement his obligations under the "road map," the 2003 plan that serves as the basis for renewed peace negotiations, according to a participant who spoke on condition of anonymity because the meeting was closed. The "road map" plan calls for Israel to halt settlement construction and take down unauthorized outposts built after March 2001, and for the Palestinians to dismantle violent groups. Palestinian President Mahmoud Abbas said Sunday negotiating teams would begin tackling the "core issues," including borders, Jerusalem and Palestinian refugees, at their meeting on Monday. Israeli government spokesman Mark Regev confirmed that teams would begin discussing those issues. "If we reach an agreement on all these issues, then we can say that we have reached a final agreement," Abbas said in a speech in the West Bank city of Ramallah, adding that a peace treaty must resolve disputes over all the issues. Israeli settlements are high on the Palestinian agenda. They consider all the settlements, not just the unauthorized outposts, to be illegal encroachment on their land. In February 2006, just weeks after taking office, Olmert sent police to tear down nine unauthorized homes in the Amona outpost, sparking violent clashes with settlers. In the two years since, he has taken no serious action against outposts. The Settlers Council issued a statement warning Olmert not to forcefully evict them again. "In Amona, Olmert thought it was not right to solve the problem in negotiations and he led to an unnecessary conflict and rift in Israeli society. That way failed and brought severe consequences and the prime minister should not attempt it again," the statement read. In his speech Sunday, Abbas said, "We told President Bush that we can't move ahead in negotiations while settlement activities are going on. We can't have negotiations while they are building houses all over." Abbas criticized the Hamas-led Gaza regime for allowing rockets to be fired into Israel but said the rocket fire hurts the Palestinians more than they Israelis, who keep demanding that Abbas take action to stop it. A Hamas statement denounced Abbas' speech as "full of lies and fabrications." Settlers started putting up outposts across the West Bank after Israel reached its initial peace accords with the Palestinians in the early 1990s, in an effort to break up territory the Palestinians want for a state. More than 100 were built without official authorization, but with the tacit or active cooperation of Israeli authorities, according to official reports. About 400 Israelis live in outposts, according to the anti-settlement Peace Now movement, in addition to about 270,000 who live in more than 120 authorized settlements. 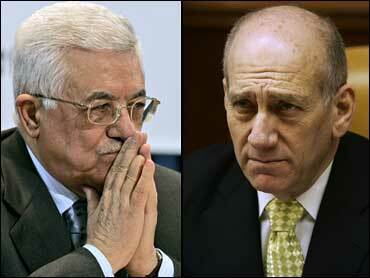 Palestinian negotiator Saeb Erekat said he hoped Olmert would follow through on the outposts. "I really hope that Mr. Olmert will honor his commitment as far as a settlement freeze and dismantling of settlement outposts and other obligations because what we need now is deeds and not words," he said.